Set the default layout for DonorSnap grids and screens. This page sets up the standard default for all the Site Administrator and all new Users that are set up. If there are already existing individual users, their Page Display will be modified but their Grids will still be set at the default when they were initially set up. Existing users can modify their individual grid design by visiting Home > User Settings. Changes under the User Settings will override what is created here in the Site Setup. 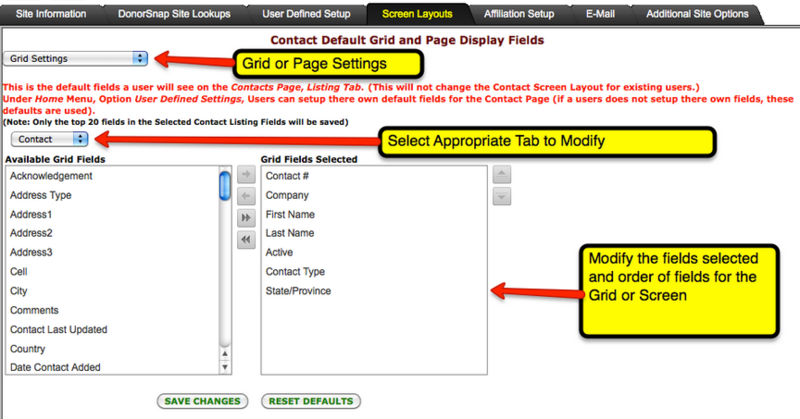 Each Grid for the Contact and its Activity Tables can be modified. You can select up to 20 columns to appear on the grid and specify the order of those columns. To modify a default grid layout, choose the “Grid Settings” at the top of the page and then select the specific Grid you wish to modify (Contact, Address, Donation, etc…). DonorSnap will display the fields that are currently not included on the grid in list on the left and those fields that are included in the Grid in the list on the right. Move fields between the two grids by using the navigation buttons found between the two lists. Adjust the order of the fields by either using the navigation buttons on the right of the list or by dragging and dropping the fields into the desired order. Remember to Save Changes before navigating to another Grid or page. 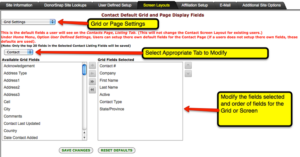 Modifying page displays is identical in process to modifying the grid layout. The Right box contains the Enabled (visible) fields; the Left box contains the Disabled (hidden) fields. Move fields from box to box with the arrows in the middle. Note that any disabled fields can be re-enabled at any time. You can omit standard DonorSnap fields that you don’t intend on using from your page (fax number, suffix, OrganizationContact). However, these fields do still exist and will be options in Excel Exports and DataMinerPlatinum. Also, when you add new records, these fields would be populated with “Null” since no information was physically entered into them. Certain fields are usually grouped together and coded with the same color. For example, Title(2), First Name(2),Last Name(2) are all colored the same. You can move them up or down in your page display order but they will also move as a block and be in the order as shown. You can move a data field from this group off the page into the column on the left. Although Address has its own Table (since a Contact can have multiple addresses) you can display the default address on the Contact Page. Once the changes are made, remember to Save Changes.